Feline fun starts with batting around a ball that has leather strigs. Two balls to a set. 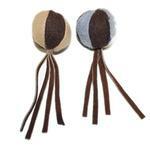 Cat's will have fun hitting the ball and chasing the the tassels around the room. Ball has is striped in two tones. 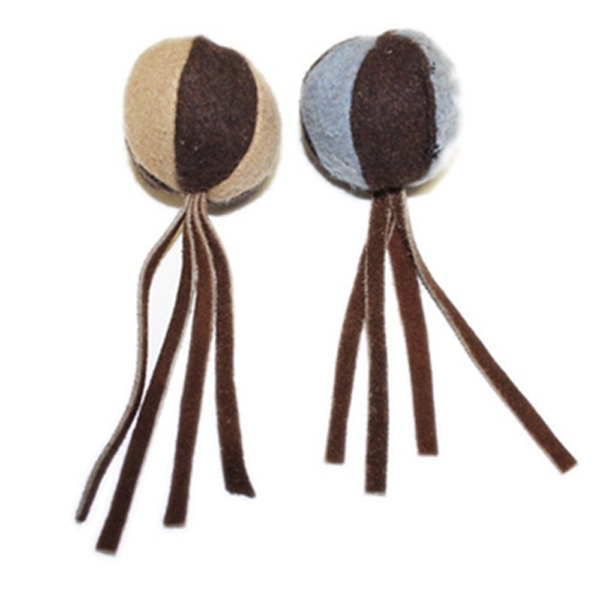 Brown leather tassels come out of the ball. Two balls come with the set. My kitty likes batting this toy around. He also enjoys the leather tassels to both chew on and use to grab the toy. Seems very durable. I love the sweaters from BaxterBoo. They are very thick and very warm. Two of my girl dogs LOVE the dress sweaters and they look adorable!! One of my boys is always very cold and loves the thick warm sweaters!! I cannot find sweaters of this quality in ANY stores! !